Is there a better alternative to BikeGears? Is BikeGears really the best app in Health and Fitness category? Will BikeGears work good on macOS 10.13.4? 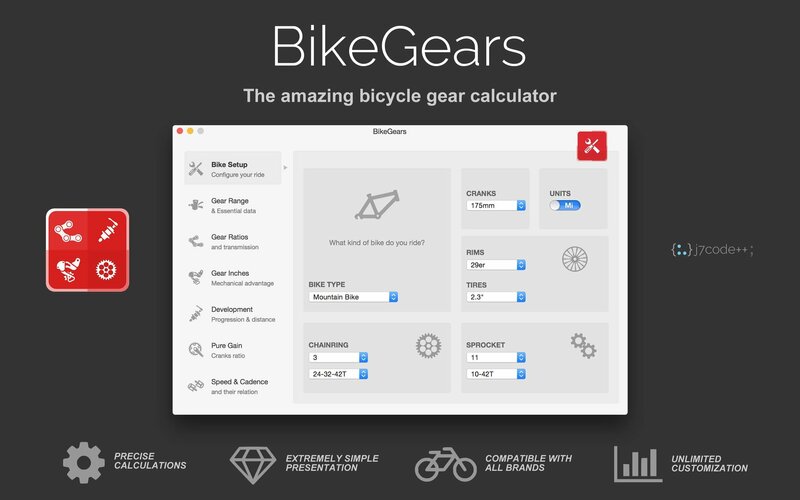 BikeGears is the easiest way to get the facts, with precise calculations and extremely simple presentation. Simplicity in Mind - BikeGears is about simplicity, providing you all the functionality that you need without the fluff. From bike mechanics and professional racers, to amateur mountain bikers, road cyclists, and commuters, everyone can gain from it. BikeGears needs a review. Be the first to review this app and get the discussion started! BikeGears needs a rating. Be the first to rate this app and get the discussion started! What Gear is Right for You? - BikeGears allows you tune up and customize your desired specs: type of bike, chainring, sprocket, cranks, rims, tires... It helps you to compare and match your bike, or your dream bike, in a clean and consistent way. The screen dashboard provides quick answers for riders' "what-if" questions and tailor their rides to their riding style. No more guesstimating. View Essential Information at a Glance - BikeGears helps you to determine gear ratios, gear inches, range, pure gain, speed, cadence, pedal rotations, wheel sizes, development progression, distances, mechanical advantages and much more. It comes packed with tons of features and preset configurations from several brands. Yet still it manages to keep the experience elegant and simple. It is compatible with Shimano, SRAM, Campagnolo, Suntour and every other manufacturer of bike parts. Unlimited Customization - BikeGears supports virtually any bicycle. It gives you pretty much unlimited control over your bike. Use metric or Imperial units -- millimeters or inches, kilometres or miles, your choice. The sleek, vibrant interface will show you animated charts and easy-to-read calculations. Plan your trips, use your helmet and know your gears. Have a safe ride!